McAllen Chamber of Commerce board members inviting everyone in the community to attend. McAllen, TX. 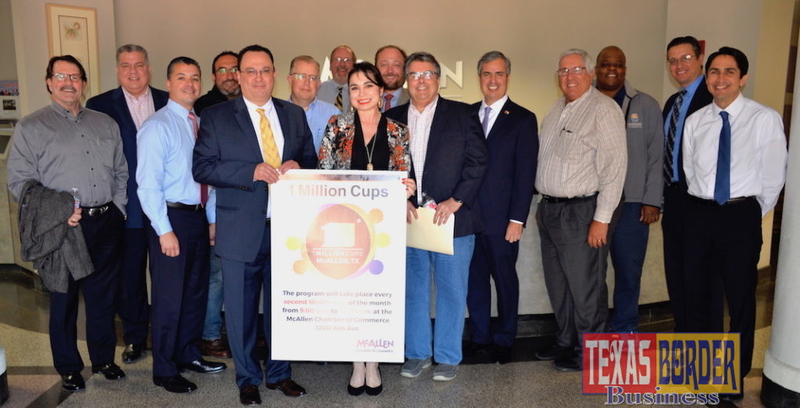 – The McAllen Chamber of Commerce is hosting again 1 Million Cups, a free community program to engage, educate, and connect local entrepreneurs with the goal to build a strong startup community over a cup of coffee and a conversation. The program will meet once again on February 13th, 2019 and runs from 9:00 a.m. – 10:00 a.m. at the McAllen Chamber (1200 Ash Ave, McAllen). 1 Million Cups, developed by the Kauffman Foundation in Kansas City, was created to expand our nation’s entrepreneurial network. The rationale is if entrepreneurs share 1 million cups of coffee, incredible business outcomes will occur in that community. 1 Million Cups is currently in 100+ cities around the country. For more information, visit 1millioncups.com. The program’s model is consistent in each location across the country. Every second Wednesday of the month, two early-stage startups present their companies through a six-minute presentation to an audience of mentors, advisors, venture capitalists, other entrepreneurs and the community in general. Once their presentation is finished, they will get the opportunity to field questions from the audience for another 20 minutes. The program will utilize key leaders in McAllen – Steve Ahlenius, McAllen Chamber of Commerce; Jorge Sanchez, McAllen Chamber of Commerce; Brian Godinez, ERO Architects; Larry Delgado, SALT; Stephan Wingert, The Monitor; Fabiola Urgel; Vantage Bank; Veronica Whitacre, City Commissioner; Elizabeth Davis; Mi Cocina by the Hour; Drew Lentz, Code RGV; Stephanie Hawk; Cobalt Digital Marketing; Art Ortega, Ortega Ventures and Investments; Ramiro Garza, RG Economic Advisors ; Lisbet Hardison; Plexus Consulting Group; Joseph Habbouche, Atlas, Hall & Rodriguez, LLP and Silver Treviño, Ready Tee. “The McAllen Chamber of Commerce is centered on business, leadership, and entrepreneurship, so when found out about this program we knew it was a perfect fit for our entrepreneurial ecosystem,” stated Jorge Sanchez, Vice President of Business Development and Startups at the McAllen Chamber of Commerce. This month we have: Tag U Inc., an app that revolutionizes the way we network and exchange contact information; and The Bryan House, a restored 1909 farmhouse built by American politician William Jennings Bryan, turned into a museum, events center and b&b.